to their convenient re-sealable mylar bags. 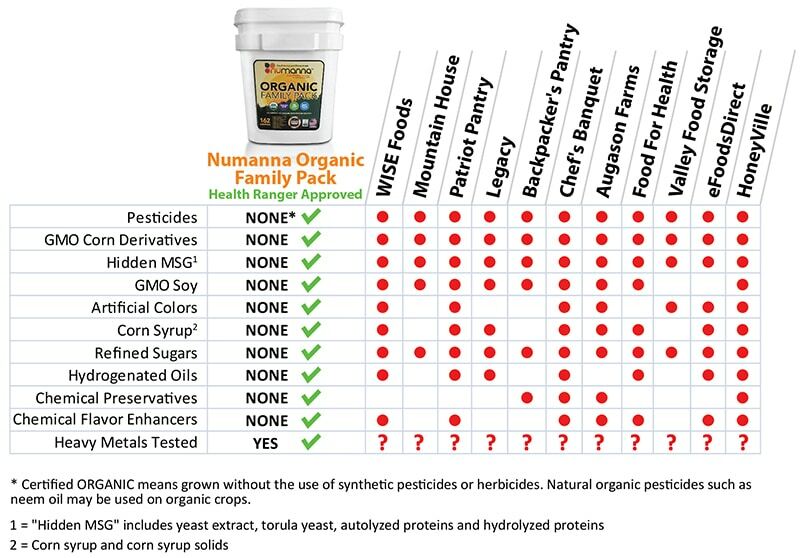 What you put into your body during times of duress truly matters and NuManna’s organic meals are clean, healthy and packed with nutrition for your family’s most important moments. 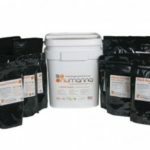 Co-formulated by the Health Ranger: All these meals were co-formulated by the Health Ranger, who also conducted the laboratory validation and purity testing at multiple stages through raw materials acquisition, manufacturing and finished product. – Easy to make – Create a terrific organic meal for you and your family by just simply boiling water and following the easy to use directions on the bag. – Great taste – The NuManna line of organic food storage products has the same great taste that you are used to. – Perfect for every day use – This food is clean, healthy and packed with nutrition. Your family will want to eat it everyday. – Non-GMO, no hidden MSG and laboratory tested for heavy metals. – Freeze-dried, high quality ingredients. – 100% North American USDA certified. – Lasts up to 1 month after opening in dry form (Up to 3 months if refrigerated). – Simple to prepare – Just add water and heat to rehydrate. – Average cook time is 15 minutes. Others could take longer. 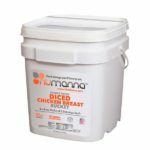 – Great addition to your food storage or perfect for daily use. 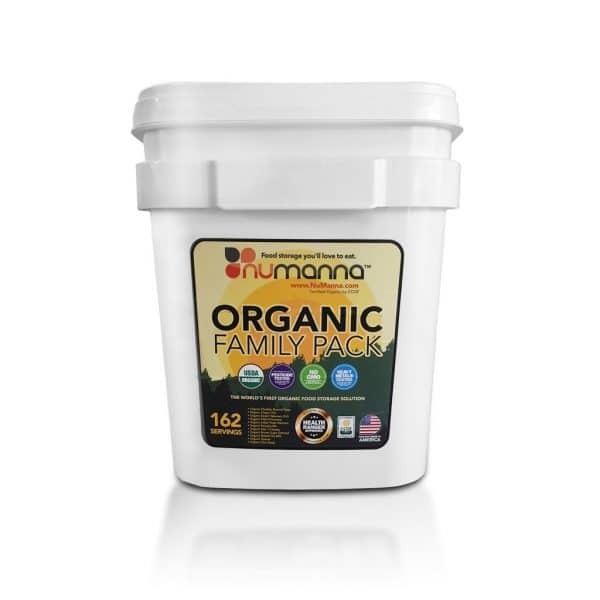 Organic Family Bucket: Includes 162 Total Servings of organic goodness. Remove oxygen absorber before cooking. 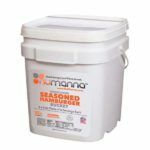 NuManna Foods uses about 1 cup of water per serving cooked. This will vary slightly among the different varieties. Specific cooking directions are included with each pouch. Organic Pasta (Organic Whole Durum Wheat Flour, Organic Milled Flaxseed), Organic Non-dairy Creamer (Organic Palm Oil, Organic Skim Milk Solids, Organic Rice Syrup Solids, Sodium Citrate, Tricalcium Phosphate, Organic Soy Lecithin), Organic Cornstarch, Organic Cheddar Cheese (Pasteurized Organic Milk, Salt, Cheese Culture, Enzymes), Organic Sweet Whey, Sea Salt, Xanthan Gum, Organic Annatto Color, Organic Cane Sugar, Ascorbic Acid. Pre-cooked Organic Pinto, Organic Pre-cooked Black Beans, Organic Tomato Powder, Organic Cornstarch, Organic Dehydrated Vegetables (Onion, Red & Green Bell Peppers), Organic Chili Powder, Organic Cane Sugar, Organic Spices, Organic Garlic Powder, Sea Salt, Caramel Color, Organic Onion Powder. Organic Non-dairy Creamer, Organic Cornstarch, Organic Sweet Whey, Organic Cheddar Cheese, Sea Salt, Organic Onions, Organic Broccoli, Xanthan Gum, Organic Parsley, Organic Annatto, Organic Cane Sugar, Ascorbic Acid. Organic Pasta (Organic Whole Durum Wheat Flour, Organic Milled Flaxseed), Organic spray dried Tomato, Organic Cornstarch, Organic Dehydrated Vegetables (Onions, Tomatoes, Green Bell Peppers), Organic Cane Sugar, Organic Garlic, Sea Salt, Organic Parsley, Organic Annatto Color, Organic Spices. Organic Pasta, Organic Non-Dairy creamer, Organic Cornstarch, Organic Cheddar Cheese, Organic Crimini Mushroom Powder, Organic Dehydrated Vegetables (Peas and Broccoli), Sea Salt, Organic Garlic, Organic Spices. * For those who are super sensitive to certain types of mushrooms, this recipe contains a small amount of powdered authentic crimini mushroom in the sauce. Organic Pre-cooked Pinto, Organic Pre-cooked Black Beans, Organic spray dried Tomato, Organic Cornstarch, Organic Pineapple Dices, Organic Dehydrated Vegetables (Onions, Red & Green Bell Peppers), Organic Chili Powder, Organic Cane Sugar, Organic Spices, Organic Garlic Powder, Sea Salt, Organic Caramel Color, Organic Onion Powder.